Sometimes when troubleshooting a connection problem, it may be helpful to attempt an FTP connection from the Windows command prompt (or in Windows Explorer). Establish an Internet connection as you normally do. In Windows 7, Vista, NT, 2000, or XP, type cmd and then click OK. In Windows 95, 98 or ME, type command and then click OK.
A command prompt will appear in a new window. If all is well, then you should now be connected to the remote FTP site. Type dir and then press Enter to see a list of files and folders. To end your FTP session, type quit and press Enter. If you cannot connect this way, then depending on the results, you may be using incorrect login details (host address, username or password), or you may need to configure your firewall. 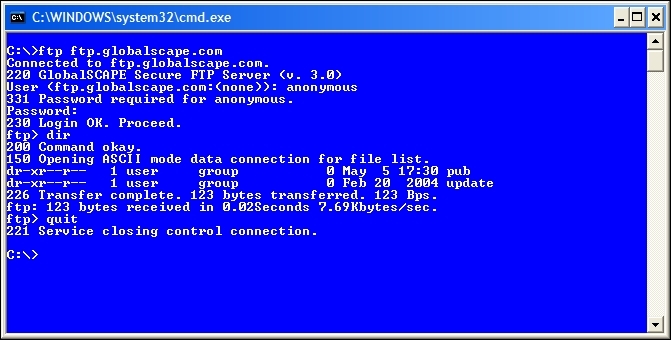 The following screenshot illustrates a successful connection to ftp.globalscape.com via the command prompt. How do I copy the Web address of a help topic? Where can I find the EFT EULA/license? Rated 2 stars based on 367 votes. Article has been viewed 338K times.